Cuando su crucero atraque en Bergen, aproveche al máximo su tiempo en la zona reservando este crucero por los fiordos y Skjerjehamn. Conozca los aspectos más destacados de la zona con los comentarios comisariados de una guía, que incluye Nordhordland, Skjerjehamn y las corrientes de marea de Alverstraumen. Esta excursión viaja en barco expreso, ahorrando tiempo y permitiendo a los viajeros obtener una experiencia completa de la zona en un recorrido más corto. Recogida y regreso en el puerto de cruceros de Bergen. This was an outstanding tour with Bijorn and Hanne! I would definitely recommend it. Don't be dismayed by the price, it's actually much cheaper than the other big group tours if you go with 3 or more people but it's so relaxing compared to the big tours where you are constantly being rushed from one train to bus to boat to bus to train with no time to eat or use the bathroom. After spending 4 days in Norway with a full tour each day I can share some things that will help you plan your trip. First of all we did a great day bus tour in Oslo. It is the grand Oslo city tour on Viator. I would recommend the bus tour for sure as the tour guide gave us a great lesson on the history and current events in Oslo. We also had a great walk through the sculpture garden which was incredible and the only problem with this tour was that there wasn't enough time to enjoy the things we wanted to. For example we would have loved to have stayed in the sculpture garden for another hour at least. This wouldn't have been a problem during this 6 hour tour with Bijorn and Hanne who took their time with us wherever we wanted and it ended up being an 8 hour tour. 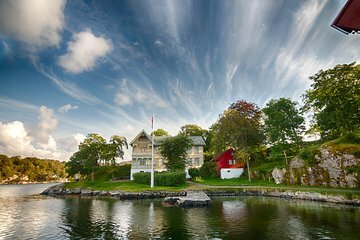 The other thing about this tour is that the Fjord in Oslo isn't really one of those beautiful ones that you are flying to Norway to see, it's more like a boat ride in a harbor or bay. The Oslo Fjord is not one of the 25 wonders of the world as the others are. The 2nd day we took the train, boat and bus tours from Oslo to Bergen. The train ride for the first 5 hours is nothing special. I kept thinking is this the most beautiful train ride in the world? But we got off the train at Myrdal and then went to Flan by train and that ride is the beautiful one. It is quite nice but not nearly as amazing as the boat ride through the Fijord. That was spectacular and a must do for everyone. The only thing is that the tickets we got were not correct, it was my fault, I didn't realize that we were emailed some tickets and some codes that we needed to go and get printed as tickets and the customer service person in Flan didn't realize it either when my gut told me something was wrong and to go ask. So when we tried to get on the bus after the boat ride the driver told me that what I had was not a ticket and that we were leaving immediately so I couldn't go to the customer service desk to print the tickets and we only had 13 minutes from the bus arriving to get on our train to Bergen and that I would have to buy new tickets in Voss when we got there immediately. I didn't know how I was going to do that in 13 minutes. So my bus ride was stressful as I sat there trying to figure out what to do. This never would have happened with our private tour. After spending the day with Bijorn and Hanne, I saw how relaxing it is to just have our own private group! So worth it! The 3rd day tour also had a problem as when we went to get on the bus there turned out to be no bathroom on the bus and my girlfriend really needed to go so she ran to the bathroom the driver recommended after he said we didn't have time and then told me that if she didn't get back in 2 minutes he was going to leave without her and I would have to get off the bus and be stranded in Voss and miss our 430 per person tour. Luckily she came back in 1 minute after being denied use of the bathroom in several places and running as fast as she could from cafe to store being told she couldn't use their bathrooms. Again, very stressful. I wish we had known about Bijorn and Hanne from the beginning and we would have booked private tours with them to see the Fjord's of Norway. Now about this particular 6 hour cruise with them. First of all I have never been on a boat going that fast before. Be sure to dress very warmly! It was a nice ride an Bijorn is an endless fountain of knowledge and very forthcoming which was fun. He and Hanne treated us like friends from the beginning and we had a great time the entire day. Once we got of the boat we ate at a very quite restaurant that even the locals don't know about. We saw unique art work and then we took a beautiful drive through the country seeing fjord's from up above as we drove in a nice Mercedes van. Bijorn had a mini-fridge right in the van with drinks for us and he took us to something locals don't know about, a green lake/pond at the bottom of an old rock quarry full of minerals that we put our feet in. It was so cool! We stopped anytime we wanted for a bathroom or for food. We asked any and every question we could think of about the current or historical times of Norway and Bijorn is incredibly well informed. He is a true world traveler who went 27,000KM just this summer and has lived in the United States so he makes an outstanding guide. He is also quite funny. Personally if I had it to do over again I would book private tours with Bijorn for the whole trip, rather than the group ones.